On 23 October 2018, the United Nations Volunteers (UNV) programme and the China Youth Volunteers Association (CYVA) signed their first Memorandum of Understanding (MOU), with the aim to strengthen the capacity of Chinese youth by providing opportunities to serve as UN University Volunteers and develop their capacity to contribute to sustainable development in China and across the region. 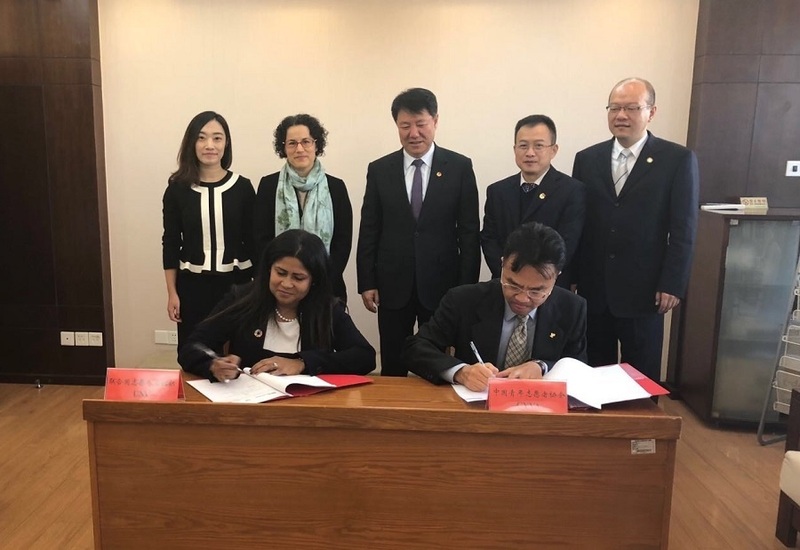 Mr. Zhang Zhaohui (right), Secretary-General of the China Youth Volunteers Association, and Ms. Shalina Miah (left), Regional Manager for UNV in Asia and the Pacific, sign the Memorandum of Understanding in Beijing, China. The signatures under the agreement were delivered by Mr. Zhang Zhaohui, Secretary-General of the China Youth Volunteers Association and Ms. Shalina Miah, Regional Manager for UNV in Asia and the Pacific. CYVA administers China’s largest youth volunteering network, with over 40 million registered volunteers in provincial or municipal volunteering organizations. Under the three-year MOU, UNV and CYVA plan to develop and implement a UN Youth Volunteer programme where Chinese youth will have the opportunity to serve in the UN system on issues related to the Sustainable Development Goals (SDGs). Through the programme, they will increase their knowledge of sustainable development and become Youth SDG advocates in China and across the region participating in the Belt and Road Initiative (BRI). The cooperation will also strengthen CYVA's international role on youth inclusive engagement for the SDGs, create opportunities for Chinese youth to volunteer internationally in a multilateral setting as a model of South-South Cooperation, develop the students’ capacities to become global leaders, changemakers, and drivers of sustainable development in China and across regions participating in the BRI. China has a long-standing relationship with UNV. From 2008 to 2018, Chinese nationals have participated in 239 assignments - 157 national and 83 international - within the UN system. This agreement will not only contribute to supporting youth’s energy and efforts, but also help foster within young women and men the important values of solidarity and meaningful civic engagement.